From left to right, state education board members Estela López and Allan Taylor and Education Commissioner Dianna Wentzell listen to testimony during a public hearing two years ago. Estela Lopez, who served as vice-chairman of the board, and Erin Benham have been asked back, according to an administration source. 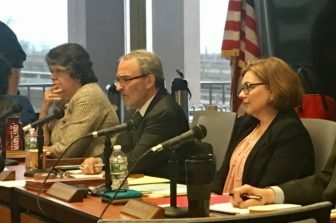 Lopez, who served on the State Board of Education for eight years, was the interim provost of the Connecticut State Colleges and University system for 18 months from January 2015 through June 2016. Before that she served as a senior associate with Excelencia in Education. She served as the vice chancellor of academic affairs from 2002 to 2007. Benham, who served on the board’s accountability and support committee and the legislative and policy development committee, taught in the Meriden Public Schools for 36 years and served as president of the Meriden Federation of teachers and executive committee vice president of AFT Connecticut. She served on the state education board for four years. Benham could not be reached for comment. Both appointments will have to be approved by legislators. An administration source noted that the two additional board members will give the board the quorum it needs to hold meetings. The board’s last meeting was cancelled because it did not have a quorum. Six members rotated off the 11-member board in March. There must be a quorum for the board to proceed with plans to recommend a candidate to the governor to fill the commissioner of education post. An administration source said the position has been posted and that the state’s superintendents have been notified of the opening. Lamont has a preferred candidate for the job, but under state law the Board of Education recommends a candidate or two to the governor. Then the governor nominates his choice to the Connecticut General Assembly. The administration source said that four additional board members will be named soon.